This guitar feels very now, rather than a relic or reissue from a bygone age. Boutique-style build; the pickups; hardware; Fender-y rock-edged voice. No gigbag supplied; ‘Marmite’ body outline. The 3, with its slanted single coil, is even more Tele-like, retaining the same width throughout, while the walls are cut down on the bass to treble sides to match the slant of the pickup. All the guitars are voiced with USA-made Seymour Duncan pickups. 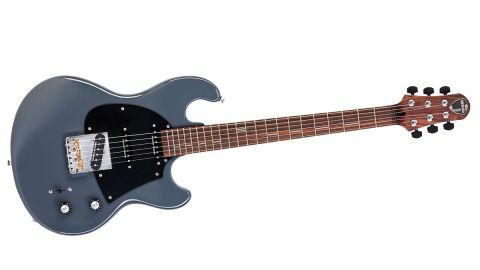 All three guitars in this range are very well-sorted guitars, nicely weighted with slinky playability and a comfortable, workmanlike strapped-on feel. Barring a few pickup height adjustments, we’d happily head off to a gig with any of ’em. The neck shape is a full and very well shaped C (21mm deep at the 1st fret; 23.5mm at the 12th ), the shoulders are nicely tapered, and there’s a subtle roll to the fingerboard edge. Its ‘everyman’ shape disappears in the hand, feeling equally comfortable with thumb-around or behind left-hand positions. Subtle considerations, such as control and switch placement, fall intuitively under your hand, and pot tapers are smooth. Everything works and you get a reassuring sense of quality. By design, the guitars are pretty rock-centric. There’s an almost ubiquitous quality to the JB-equipped models, which creates effortless classic rock punch; less so the sparkly, brighter, vintage PAF. The 3 offers the widest contrast to the 1 with the strongest Fender-like flavour. There’s still the clarity and note separation, though, which is noticeable on all three, and while its more single-coil voice is less woody than you’d expect with an alder body/maple neck Tele-like guitar, it provides a well-voiced foil to either the 1 or indeed the hotter, darker 2.